Thread: cx bike or rigid MTB? Need some advice and suggestions. I've been commuting (15 miles each way), around-towning, and towing kiddie trailers with an old Santa Cruz Superlight running 1.5inch commuter tires. It does the job, but is overkill and slow. I need something that can handle canals, curbs, bike lanes with potholes and the roads through the Res. The Superlight is overkill, but a carbon road bike would be too fragile. I do like the stable, slack angles of the mtb when I have to stop for lights, and its re-assuring when towing the kids or hauling the dog by the leash to not be on anything too twitchy or steep angles. A CX bike looks like it would be burly enough and light enough, but I'm a bit worried about the geometry not lending itself to quick get-offs with the kids, dog etc. Would a rigid MTB like an El Mariachi or even a cheaper Kone Dew be a better choice? I want some gears, no ss for me. Weight per se is not the issue, but, if I'm just swapping one sluggish bike for another with no benefit I might as well keep the Superlight. Last edited by chollaball; 06-04-2009 at 01:31 PM. Salsa Fargo perhaps????? Looks burly enough for a little of both....just keep two sets of wheels in the garage with your road tires and your knobbies loaded and ready to go. I need something that can handle canals, curbs, bike lanes with potholes and the roads through the Res. The Superlight is overkill, but a carbon road bike would be too fragile. I do like the stable, slack angles of the mtb when I have to stop for lights, and its re-assuring when towing the kids to not be on anything too twitchy. A CX bike looks like it would be burly enough and light enough, but I'm a bit worried about the geometry not lending itself to quick get-offs with the kids. Would a rigid MTB like an El Mariachi or even a cheaper Kone Dew be a better choice? I want some gears, no ss for me. Do you notice any difference between the cross check and the converted Schwinn? you do ride both off road. The Kona Dew is going to have the mountain bike geo you're looking for. Its going to be heavier. Salsa Fargo is sweet. Something steel would definitely work, it would feel a bit more "solid" while also giving you a softer ride. The Kona CX bikes are a pretty good deal, come with a good parts spec too. 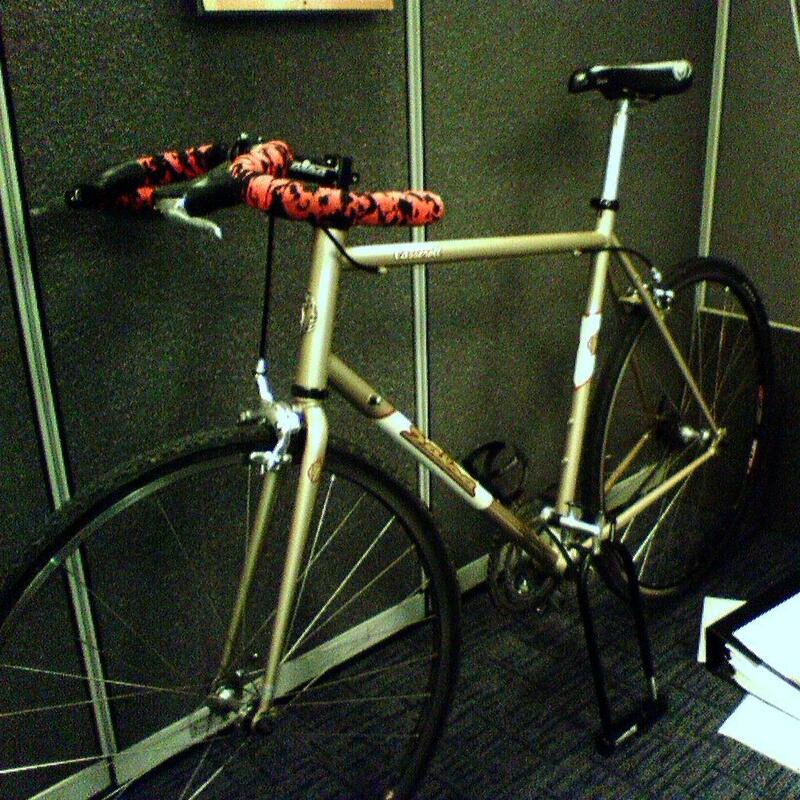 I had a Kona Sutra for awhile (until I got hit by a truck), tough bike, but aluminum frame. Had pretty good clearance, disc brakes. I like the Tempo as a fixed gear for all-round riding. Pull a B.O.B? okay. burley? why not? Hit Trail 100 when your drunk? sure. I like the Cross Check for everything as well. Single track anyone? Quite a bit more stable than the 23 year old racing frame Schwinn. The El Mariachi make for a fine singlespeed, though towing is not is forte. Another vote for a CX bike. The Cross Check or Voodoo Wazoo (http://www.voodoocycles.net/wazoo.htm) would be a great call. A touring bike or a cx bike should meet the needs. Lots of high volume bike makers make flat boar road bikes. These bikes tend to be more of the geometry that you're looking for. I think 700cc wheels are key if you are commuting. Just make sure the rims are heavy and wide enough to roll the occasional 1' curb or to nail a pothole at high speed without folding. Also, a fat road tire like a Conti Contact 32. This tire lasts forever and is perfect for commuting/graded dirt roads/canals. I have my Salsa Casaroll set up with old, heavy CX/touring wheels, conti contacts. Let me know if you want to look for an old frame and wheel set. I've been building up commuter bikes for years. Here are the remains of a bike I helped my brother put together from an old 64" Myata frame (he was rear ended) and my current commuter. bar end shifters and an old Sora derailuer can change it up easily to tow the baby with. Id recommend throwing some of these on as well. Almost impossible to get a flat. Singular Peregrine or Rawland Drakkar, though it is not available until fall. I would look for a cheap touring bike w/ 27'' wheels for towing kids getin' round town etc. surley long haul trucker looks nice too. I'm a proponent of converting old steel road frames into singlespeed/fixie style go-everywhere bikes. Throw on some knobby 35s, track down some non-aero levers for the brakes, maybe 'stache bars if you're feeling sassy, you're done. Probably under $200 even with a nice/tough wheelset. I've done a couple of them and they continue to provide a great ride. Really Paul where do you get the bike to start with, anything semi decent on ebay sells for way too much. PHX craigslist has a couple bikes in today's postings I would consider possibilities based on size and tire clearance of course. These might not fit one's particular needs/wants, but they pop up on a fairly regular basis. I second the Cross Check... love mine. But I don't have any spawn to tow. I can vouch for it's effectiveness at getting me home from the bar. They are building my wife a hardtail as we speak.I want them to build me singlespeed in the future. * Locked up and stripped outside stores (this is where I got my totally kickass '84 Nishiki -- POS bike had been stripped and left for dead outside a Whole Foods. My price: $0 and a few minutes with a bolt cutter. EDIT: see photo). There are thousands of old steel frames -- the ones with the must-have forward-facing semihorizontal drops, whatever they're called -- just laying around. Thanks everyone for all your comments so far. My budget for this is about 1k which seems like could get me a Cross Check, Karate Monkey or a nice Masi that Rage has on the floor. figuring $4-600 of that will come from selling the old bike. My biggest need is to improve speed and weight which suggests a CX bike over an MTB, but setup in a way to be a slacker\upright ride - really like the idea of wider rims and flat bars. I need to test ride one with my bike trailer and make sure the feel is ok. Then shop and get prices on whole new bikes vs frames, and some parts. Some old old frames I think you kinda be ready to get deep in there and fiddle which I'm not sure I'm up for when a new frame is only a couple hundy (Surly Cross check for example is only about $425). 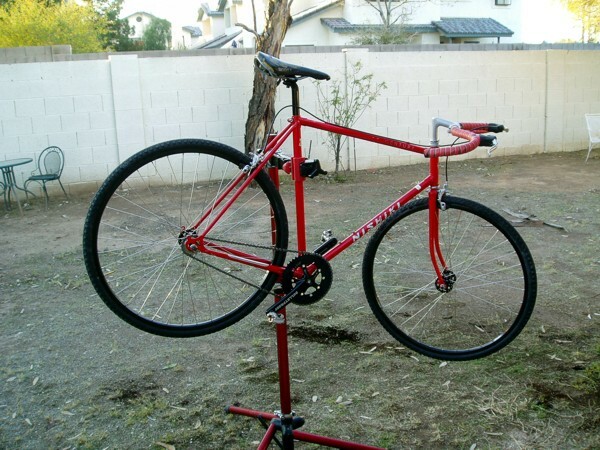 I used to tow the trailer with my Haro SS frame set up for the road - 42 x 18 with Serfas Drifter street tires. Fast, comfy and hauled the trailer x 2 kids as fast as I could pedal. I'd still be using it but got an old Schwinn Speedster that rules the road. I've been craving one of these for the last year. And I like Salsa's sensible part choice on the complete. Performance in Chandler has some nice Fuji CX bikes. the long-and-short of it is this: for the kind of utilitarian riding your doing across the rez (i grew up riding from scottsdale out across the rez on the canals; i know them pretty well... still ride them to phx mtn preserve trails whenever i visit the valley) you're probably gonna find the cross bike running like 38mm knobbly tires to be the most suitable, as a jack-of-all-trades sort of bike. i've had a surly crosscheck for years, and i ride it to work a lot; my mornings are always on the road... bumpy, potholed, flagstaff road... my ride home, which varies, always includes a few miles of singletrack, some of it on the tricky side of things. i am a believer in the utility of the cross bike. i've ridden that bike all over the southwest and honestly, it's never ever been the fastest bike on the ride, nor will i ever suggest it's most comfortable, or stable, or whatever. but i will say this: if i had to sell them all, and keep just one bike that would get me /almost/ everywhere i want to go efficiently, i'd keep the crosscheck. it's that kind of bike. my desert island bike, i guess you could say... tho truthfully, i've had it on the beach in mexico, and even with 44s it's kinda hard to ride in deep sand (canal bank sand holes, not so bad), so i really would probably not opt to take it to a literal desert island. but, regardless, i hope you get my drift. I had a Cross Check, Now I ride a Monkey with the same set up. They ride the same, but the Monkey is a lot more versatile in terms of the tires it can take/brakes, etc. I would get (and did get) a rigid MTB for the duties you describe. Finally figured out that I want a commuter bike, not a kid tow-er or offroad SS, since 95% of my miles for this bike are commuting or around-towning. Had some $$ and f'ing sick of The Unholy Abomination (the ~30 lb Superlight I've been CXing on). Demoed a Masi Special CX. Took it home on my commute - what a perfect test ride! Steel frame, LXish components, 24.5 lbs for under 1k. The LX components were fine, just not demanding the kind of performance from them as on my MTBs or my roadie. Otherwise, the bike was like a steel roadie or very fast rigid mtb (duh!). First time I've ridden this style. Handling, ride were good. Acceleration was not racy-roadie sharp, but just fine for urban and commute and way better than a full sus mtb. I hit every curb, bump, canal and a 1 ft drop that I do on my Superlight, and the bike handled it fine - very key for commuting in traffic. Shaved 5 min off my best commute time, and I was not at my strongest today, probably shaved 10 min off what I would have done on the SL. I also rode with my 4yr old daughter on her little bike, my leashed dog, and my father on an MTB down to the park. Watching a 70-yr old engineer ride a couch bike was at once hysterical and horrifying. Managed to keep them all safe and in control. It was harder for sure than on an MTB due to the geo, but even more cause of the drop bars and brakes made controlling the dog and going slow an awkward position for the hands and torso. But it was all doable, and not nearly as unstable as I thought it would be. My LBS will swap drop bars for risers or similar, keeping much of the aggressive roadie geo but a better beer-drinking and dog-restraining posture. this style of bike really hits the mark for my needs, especially now that I've decided a SS mtb is, if ever, going to be a separate purchase. 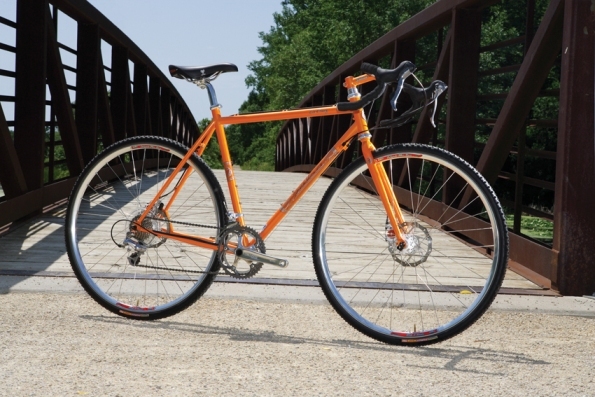 I've been looking at comparable steel CX bikes like the Salsa Casserole, Surly CrossCheck - both seem comparable parts, maybe a tad lighter, ~$200 more. Kona and Performance offer comparable specs and price but lighter aluminum frames. Yeti and a few others have 4-5lb lighter aluminum frames for ~$1k more. I gotta figure the lighter aluminum frames will not hold up as well over time, and be harsher rides, but maybe I'm wrong? The pricier Yeti will prolly be a nice ride, but that's a lot more to pay. The Salsa or Surly would be sweet rides too, but since my LBS has this bike in my size in stock and looking to sell, it would need to be a pretty compelling reason to go with one of those over the Masi. Steel is going to be a nicer ride not as fast as Al but nicer. I am in the process of striping down my road bike and moving everything over to a LeMond Poprod which is a Steel CX frame. Go with which ever bike you can ride that handles the best to you. How bout a Twenty Niner? How about a rigid geared 29er? Very versatile, you can run CX tires or fat 2.3+ tires. Or get a good suspension fork with a decent lock out like a Reba. 29er roll a lot better than 26er. I did the 26er on slicks thing, I agree its no comparison to a real road bike but a 29er is a animal. Who cares how much gas you save, ride your bike to work because it's fun!!!!!!! get the surly cross check, build it as a single speed with 44mm tires and ride it anywhere you want. + 1 on the 29er , build up a spare set of 700 c wheels. The Speciale CX is an nice parts spec for the price point. Keep in mind the cost of shifters/brake levers and maybe linear pull brakes if you move to a flat bar. There are a lot of options in this category now, including the (now on closeout) La Cruz, the Cross Check, the Singular Peregrine, the Vassago, etc. That doesn't even get into the world of rigid 29ers. Good luck. Yeti and Justinb - do you think the Surly, Salsa or some of the others are significantly better than the Masi? Yeti - you probably ask more of your CX bike than I would, esp. since 20% of my riding (90% of its riding) will be specifically for the commute mostly on pavement\canals. Availability, price, and supporting the LBS are all in favor of the Masi. but I dont want to rush to a decision (or over-analyze...). wrt steel vs. aluminum - I took my roadie very slowly off curbs, and the difference was notable. You felt the bump with the steel but it was obviously dampened, while the alum was much more jarring. The Salsa is spendier steel (TTOX), which may not be that important in light of what you intend to do. Other than that, the parts specs are pretty similar. The complete Salsa gets you 105 shifting, a 130bcd crank (can't go smaller than 38t on the front), 10 speed rear and disc specificity. If you decide to go flat bar, then you'll be tossing the 105 STI levers and either buying 10spd flat bar shifters, or using a 8 or 9spd mountain setup you already have in your parts bin and tossing the 10spd cassette. Also, v-brake levers may not play well with the road BB7s that Salsa specs. You'll go through a similar conversion with the Masi, but you can replace the canti's with V's (or find canti-specific levers), and the Tiagra 9 drivetrain should play well with any other Shimano MTB components you already have. Same with the Surly, though you won't be ditching STI levers, you'll be ditching bar-end shifters. The CrossCheck is the only SS compatible (without a tensioner or eccentric component) frame on your list. Tire clearance would be an important factor for me in this decision. Surly's are renowned for their awesome clearance, and I've seen 44 Mutanoraptors, 1.75 DryX's and 2.0 Furious Fred's clear the Salsa. I'm not sure what the Masi can clear, but it may be worth a look at the LBS. The Salsa, fwiw, is on the way out so what's in stock now is all that's available. Also the only color is orange which is either awesome or horrible depending on personal preferences and how large you like you "Steal My Bike" sign to be. I know the choice is agonizing (I've been through it all, and ended up with a Voodoo Wazoo), but just remember that whatever you do, you can't really make a mistake here. They're all great bikes. 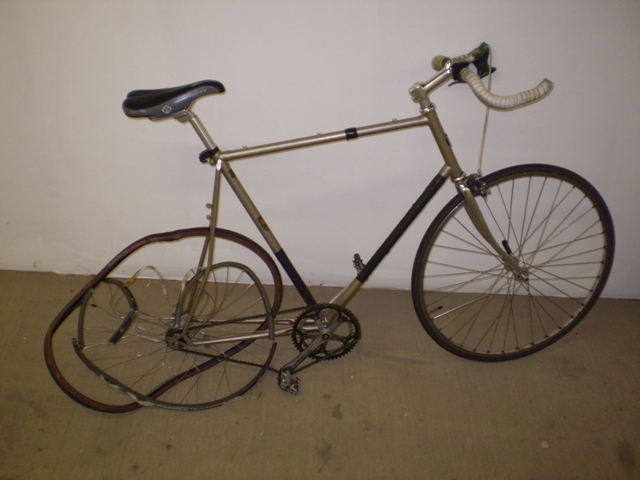 Have you completely ruled out a fixie? If not, there are some really fun looking bikes out there for way less than $1k. The Kona Band Wagon looks really sick, as does the Bianchi Pista (in blue) and Fuji Feather (in baby blue). These are all steel bikes with weight around 20lbs. Masi has a great looking fixie with gold parts, but it's a little pricier at $1400. Some have a flip-flop hub option, letting you roll single speed or fixie. Thanks Doug, but a fixie is out. I have never even ridden a SS as a big boy. i could see myself getting one based on what its done for some friends, but its lower priority for me at this time. I'd prolly go wtih a 29er HT like your Rita, but this purchase I've got a pretty specific use in mind finally. Which also makes the price of the Masi very appealing - save some coin for the hypothetical SS (or Firebird). My son and I went out on our CX bikes last night - road from Fountain Hills out to McDowell Mtn Park, did a Sport Loop and then road up the park road to the camp ground area and back. Great times! The Masi would probably work. I think differently about buying a complete bike like the Masi or pre-built cross-check. I would just get a frame and source out all the stuff yourself and build it just the way you want. The Surly (or the Salsa casserole which my wife has) are great frames for commuting. The support from the bike shop is ... what? Price can be way lower if you build it yourself. or you could tell me what you want and I could build it for you. Highline, but most people don't need pedaling that great. thanks Yeti for the comments, and for the offer! But I don't know roadie\CX gear well, I use what I got and enjoy it. My last 2 mtbs I've finally gotten knowledgable enough and semi-competent enough to spec parts, but its a labor you have to be psyched for. With this bike, I'm kinda not...the simplicity and price has me pretty well sold. I'm hoping to join you guys on one of your CX rides, and sure I'll enjoy the extra speed with MTB durability, probably learn more as I go and then have upgraditis and take you up on your offer then. thank you again! @Jayem - yes yes, a Highline would be perfect, for everything, all the time!!! seeing you climb has me less afraid of going bigger and heavier when I replace the Heckler eventually. Those steel Masi bikes look really good. If I didn't already have a CX bike I might just buy one, too.